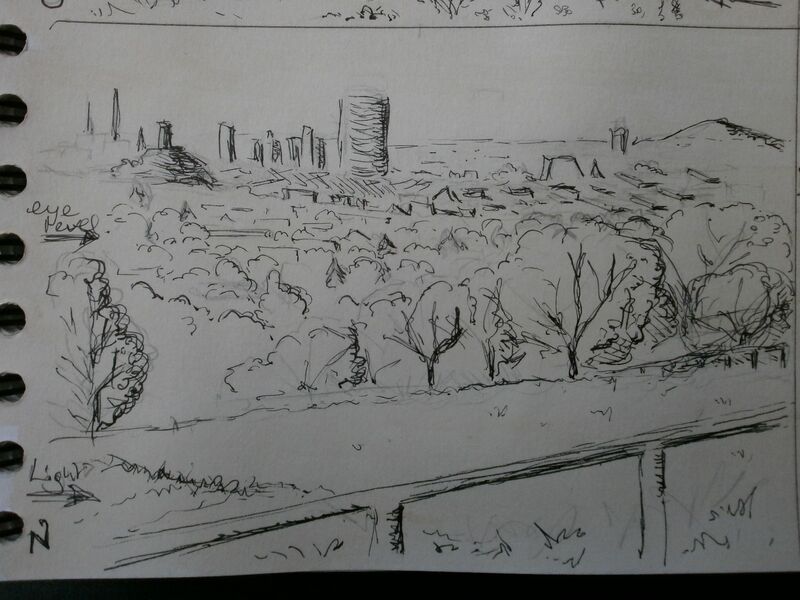 I have been looking forward to sketching outdoors now that spring is here, for the third part of the Drawing Skills course. 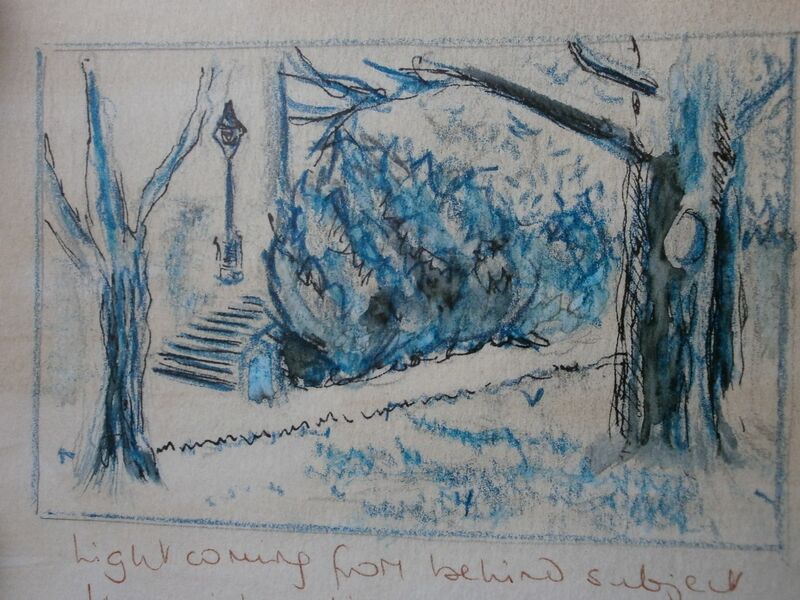 The first sketchwalk was done on a mild Saturday afternoon at the end of March in the Kurpark in Bad Godesberg. I chose this park for its variety of mature trees and large pond as well as its many vistas, existing as it does on the side of a hill, with views across to the Siebengebirge. 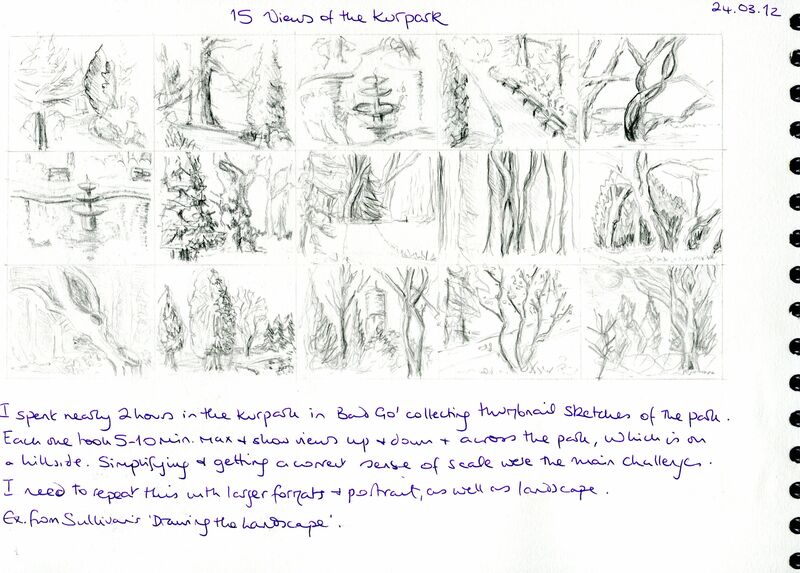 This exercise was a modification of one in Chip Sullivan’s “Drawing the Landscape”. The original exercise focused on producing a “gestural vocabulary” but my drawings are not as “gestural” as I intended and this is something that I still need to work on. 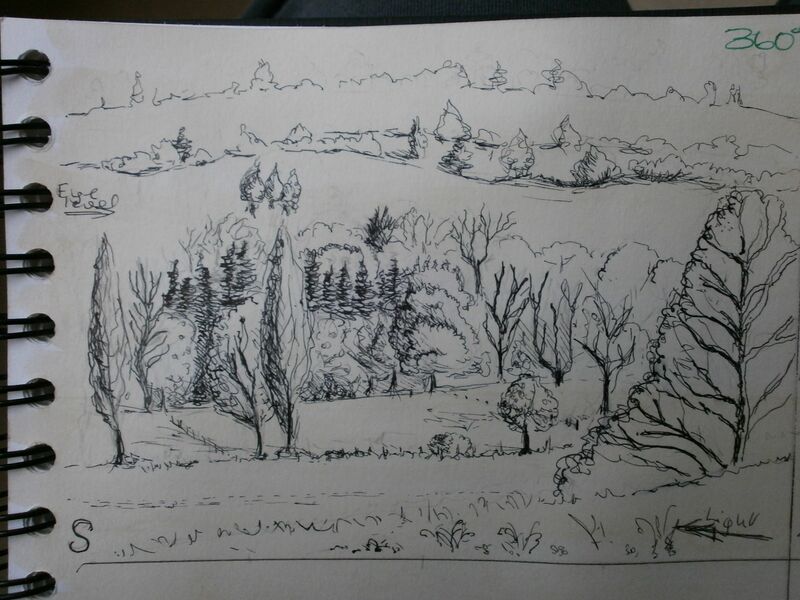 Particular challenges of this exercise were the angles of the ground on the hillside, and that it was difficult to get much distance from the trees, such that a number of the views contain a lot of tree trunks and not much else… Selecting what to draw and then simplifying it recognisably was difficult at first but became easier after doing it a few times. The prepared grid was landscape rather than portrait which was not well thought-out given that I intended to focus on trees! In the event, I chose to fill out the grid as it was and complete the exercise that I had set out to do, especially when the sun went behind the hill and the afternoon became much cooler. Although the grid was too small for detail, which was frustrating at times, it did enforce focus on the main features – the sketches had to be simple! Sketchwalk Number 2 followed the guidelines in the course material. I drew four slightly larger sketches using pencil, a fine pen and then applied Inktense pencil and a wash later. I drew on a page that had been previously washed with coffee… this did not scan well and I photographed each sketch separately to make them clearer. The originals are each only about 5 by 7 cm. I don’t like the vertical “layered” structure of the composition of the second sketch (ducks beside the lake); it lacks interest and reflects my impatience at trying to find different compositions quickly on a cold day! 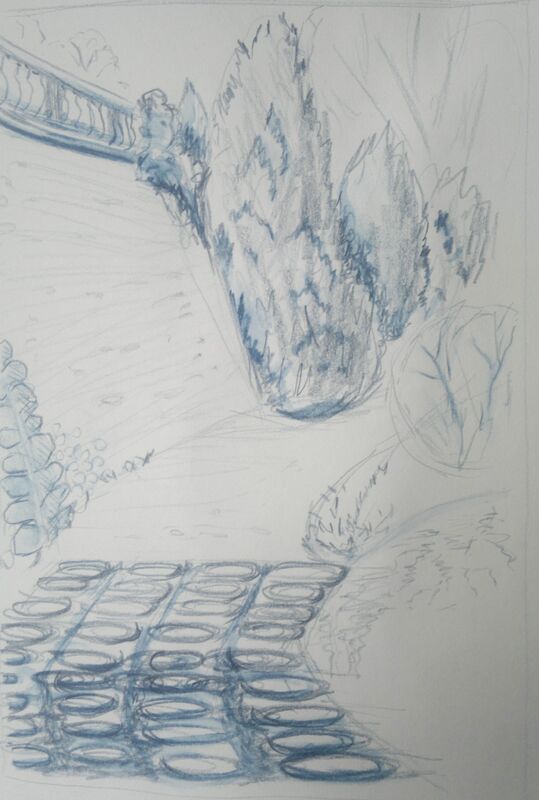 The stepping stones in the first drawing are actually paving stones and they should be flatter than drawn here! I redrew three of these sketches later in an A4 format to get a better sense of spatial relationships, as well as shadows and relative values. In redrawing, I changed the format of the stepping stones sketch to portrait to emphasise the path which extends on the other side of the stones. The stones have been placed further to the left margin, omitting some and using them to lead the eye into the composition. 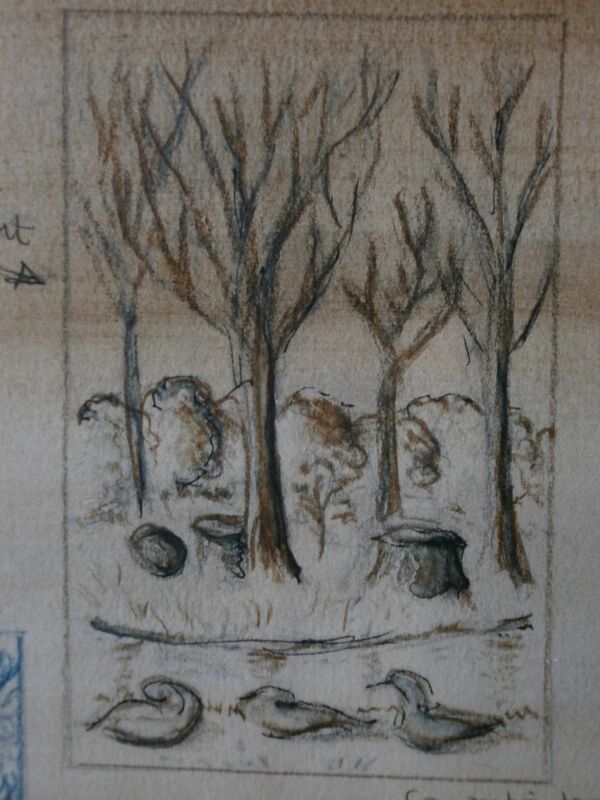 If this sketch were to be used as the basis of a drawing, the stepping stones would need to be more irregular in shape, form and spacing. The curve of the stones would also need to be exaggerated, and not all of them need be included. 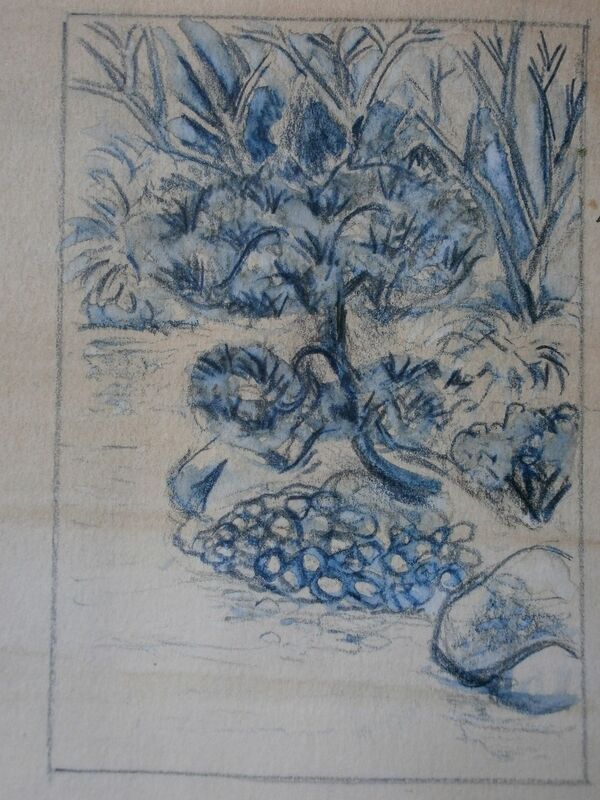 In the redrawn sketch of the miniature pine, the rocks in the water have been spaced apart a bit more, which leads the eye more gently towards the tree. 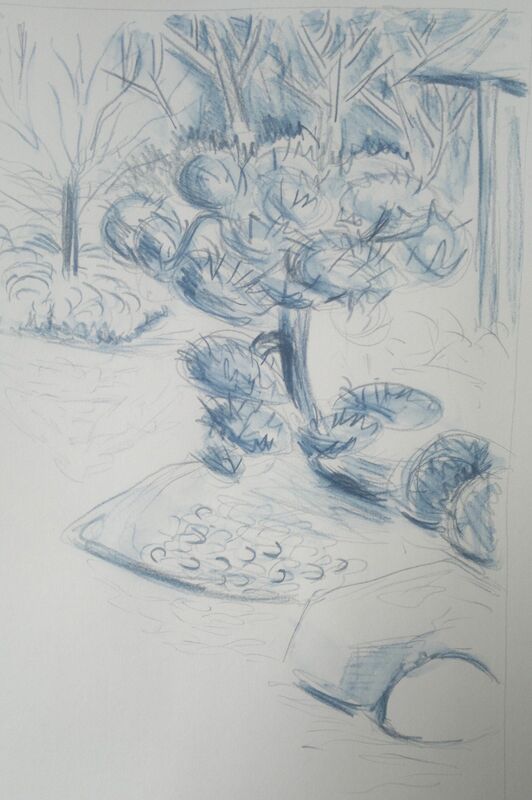 I intend to go back to the Japanese garden to sketch some more when the weather becomes warmer because there is a lot that draws the eye in a relatively small space with simple, pleasing design. 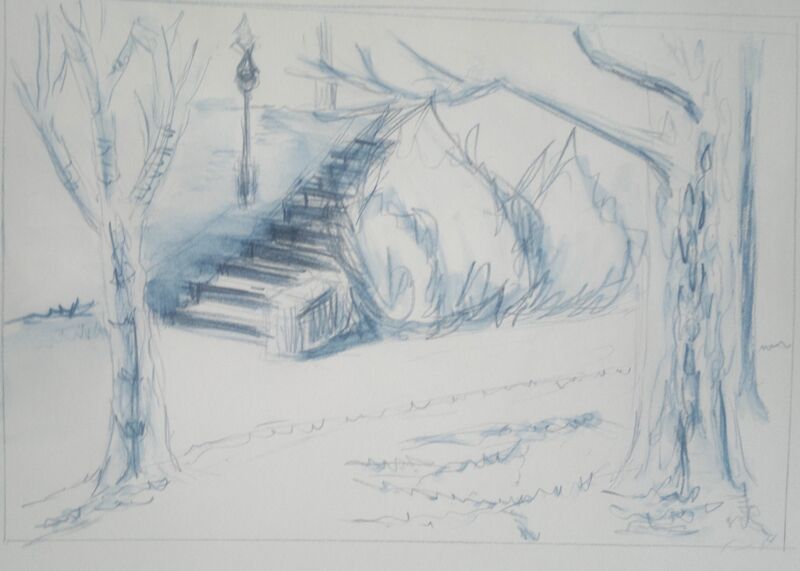 In the sketch of the steps, the values still need attention – there is not enough contrast. The weather was cold – colder than for the first walk – and with almost no sun and a constant threat of rain. Because of the dull light, there were seldom any notable shadows beyond dark edges at the base of objects. Sketchwalk number 3… This was for the 360 degrees studies. I chose a hilltop for this exercise because the views were familiar and there is some kind of view in all directions and relatively few people. 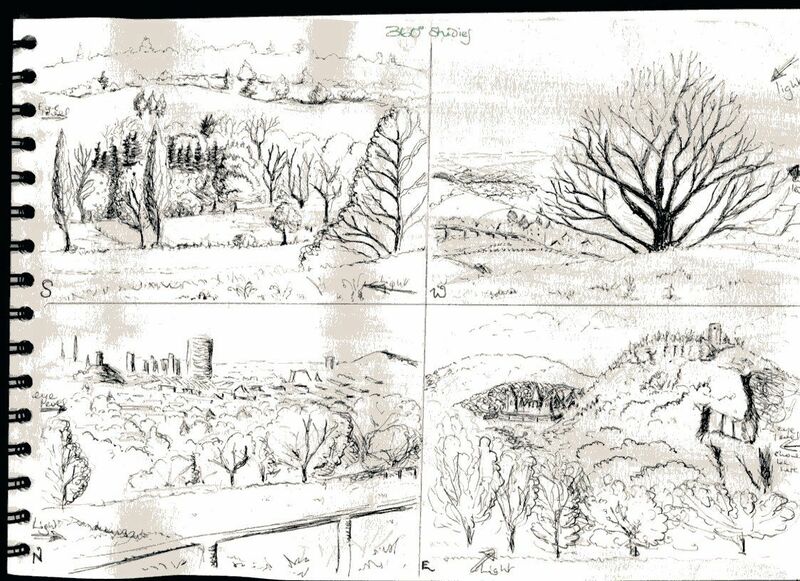 These drawings were done on a mostly sunny Friday late afternoon / early evening on the Rodderberg, a dormant volcano just to the south of Bonn. The drawings were done at the highest point, the rim of the former crater, now a nature park with fenced paths and grassland which is the habitat of many rare wild plants. 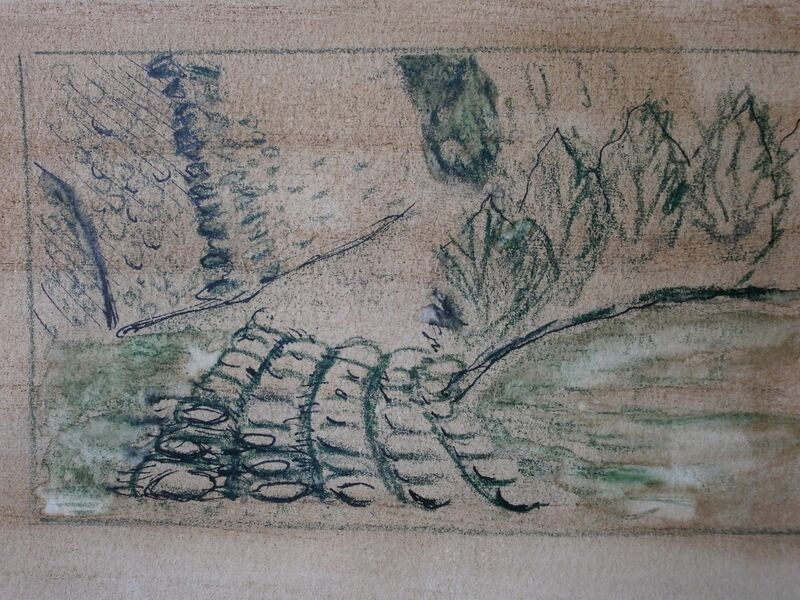 The fences appear in three of the four drawings, one – to the north – prominently in the foreground. These drawings were done in pencil initially with later detail added in fine pen. The page did not scan clearly and I have photographed each one separately for better reproduction. The view west was taken up by a still bare tree. I used a viewfinder to position it off-centre so that I could include some of the distant layers of hills behind it and to the left. Deciding what to include and what to omit was difficult for the view of the city to the north because there was very little foreground detail. The sun was reflecting off a number of west-facing windows in the middle ground and I drew these as white blocks with darker blocks facing south to hint at a town / city. I included the main tower blocks and an industrial chimney, with the Godesburg on its hill to the left and the Deutsche Post tower unmistakeably dominating the Bonn skyline. Mostly, I hinted at the built environment in the middle and background. In the suburbs beneath the hill more trees were visible than buildings. The foreground was a fence and a path leading down the hill. 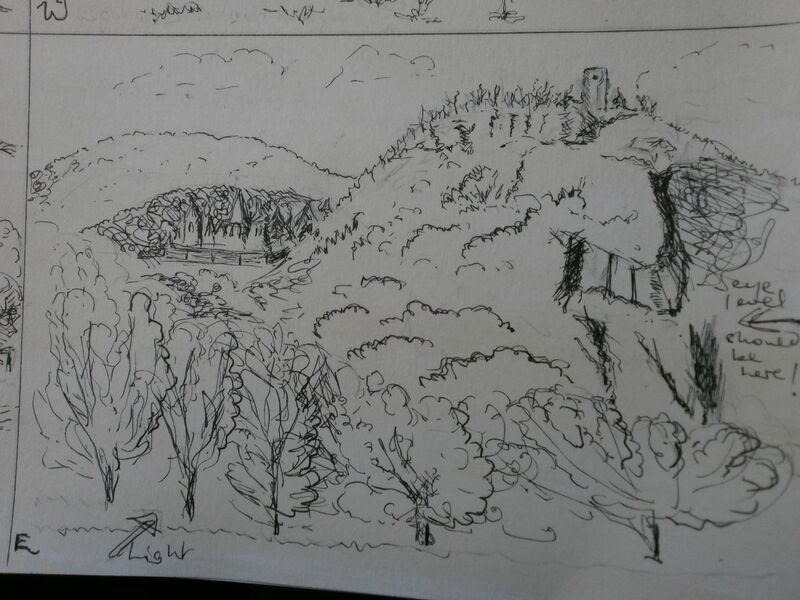 The view facing east was tricky because I could not locate a reference point at the eye level, with the result that the Schloss, on the left of the sketch, is lower down the hillside than was the case. It should be above eye level but I have drawn it more or less at eye level. One way to deal with this problem in future might be to place a pencil horizontally at the bridge of the nose – everything above the pencil would be above eye level! The most successful sketch was the one to the south, partly because I devoted more time to it and partly because it had a more clearly divided fore, middle and background. The sun was behind my right shoulder. Getting the various stands of trees in their correct proportions was a challenge, especially as trees at the same level on the hillside varied so much in their structure and height. 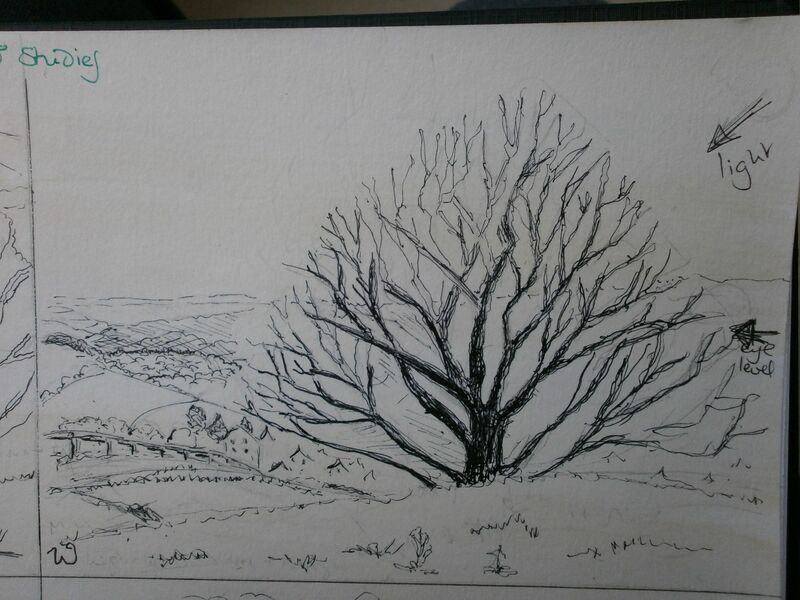 For, example, a small tree in blossom in the foreground can appear similar in height to a poplar further up the hill. Each drawing was supposed to take around 15 minutes. I spent much longer than this on the view south and then 15-20 minutes on each of the others and it shows! i’m stunned at how much you have absorbed and wonderful your work looks! wow. the sketch walk sounds wonderful, as well. i have yet to do one, but am very grateful for the inspiration! Such lovely comments to read on a rainy Friday evening after such a looooooooong week! At the mo. I don’t see much progress in my own drawing so thank you for the morale boost.